52003-DS is rated 5.0 out of 5 by 1. Rated 5 out of 5 by FCB from Hand Held of Choice We install these in all our remodels for Senior's. It is our preferred handheld shower. 1. I saw in 52003-UF Q&amp;A the ONLY diff btwn 52003-UF &amp; 52003-DS is the hose length: UF has a 70&quot; hose; DS has a 82&quot; hose. Is that correct? 2. Edward answered my ques. the handheld shower can pivot and/or tilt in every direction. The White button does what exactly? Is there a shut off valve in the personal shower head or hose? Can the shower head be replaced? 1.I need to know how the mount slides up and down and locks in place. Is it the White button or some other mechanism? 2.I also want to know whether the water can flow continuously when the shower head is left in the mount, and if there is a shut off valve in the shower head. 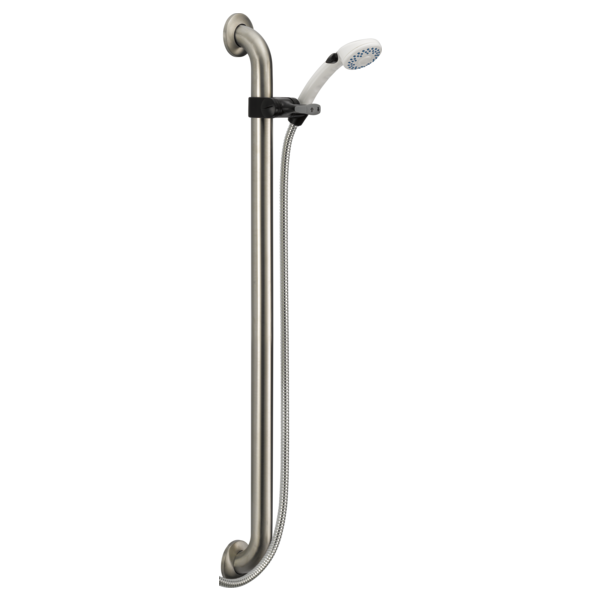 3.Can the hand held shower head be replaced, and with another brand of shower head for greater showering options? Thank you for your questions. Delta Faucet model 52003-DS has a black toggle button on the side of the handshower that when pushed will pause the handshower down to a trickle. The only way to completely shut off the handshower is at the valve. It can be replaced with a different handshower head with different features. Our handshowers are interchangeable.